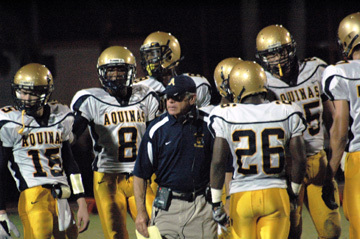 St. Thomas Aquinas (Fla.) High School head coach George Smith has been named the 2008 Power of Influence Award recipient. The Florida High School Athletic Association nominated Smith. The award, which is presented jointly by the American Football Coaches Association® and the American Football Coaches Foundation®, will be presented to Smith at the AFCA Coach of the Year dinner on Tuesday, January 13, at the 2009 AFCA Convention in Nashville, Tenn.
Smith graduated from Purdue University in 1971 and moved to Fort Lauderdale in the fall of 1972 to teach at St. Thomas Aquinas, which hired him as a history teacher and assistant football coach under Mike Gallagher. Smith became head football coach in 1975 and in 1982, he also took on the job of athletic director. He is in his 32nd year as head coach at St. Thomas Aquinas. The Raiders have achieved a great deal of success with Smith as head coach. Under his tutelage, the Raiders have won four state championships (1992, 1997, 1999 and 2007), been runner-up seven times, won 19 district championships and achieved an overall record of 318-65 at the conclusion of the 2007 season. Last season, Smith led St. Thomas Aquinas to a 14-1 record and the school’s fourth state title. In the 2006 regular season finale, Smith’s Raiders beat Davie Western High School, 45-7, allowing Smith to become one of five Florida prep coaches to win 300 games, and the first to win all 300 games at one school. In addition to Smith winning the 2008 Power of Influence Award, the Miami Herald and the South Florida Sun-Sentinel have chosen Smith multiple times for their Football Coach of the Year awards. In 2005, Smith was inducted into the Florida High School Athletic Hall of Fame. He also is a member of the Florida Athletic Coaches Hall of Fame and the Broward County Sports Hall of Fame. Smith has been a member of the AFCA since 1977 and has served on the public relations committee for the past four years. In addition, he has been a member of the Florida Athletic Coaches Association since 1972 and has served on the Board of Directors for 10 years. Other finalists for this year’s award were: Jamie Rigs, T.R. Miller High School (Brewton, Ala.); Stacy Luker, Sweet Water High School (Sweet Water, Ala.); Rich Yonker, Poudre High School (Fort Collins, Colo.); Russ Isaacs, R. Nelson Snider High School (Fort Wayne, Ind. ); Don Dobrino, Mt. Olive High School (Mt. Olive, Ill.); Ed Thomas, Aplington-Parkersburg High School (Parkersburg, Iowa); David Hylla, Proctor High School (Proctor, Minn.); James Drewry, Booneville High School (Booneville, Miss. ); Shell Dula, Greenwood High School (Greenwood, S.C.); Terry Dosch, Roncali High School (Aberdeen, S.D. ); Tim Teykl, B.F. Terry High School (Rosenberg, Texas); Craig Beverlin, Kamiakin High School (Kennewick, Wash.); Joel Eskelsen, Big Piney High School (Big Piney, Wyo.). Past Power of Influence Award winners include: Larry Dippel, Amarillo (Texas) High School (2002); John McKissick, Summerville (S.C.) High School (2003); Marcus Borden, East Brunswick (N.J.) High School (2004); Ron Stolski, Brainerd (Minn.) High School (2005); Sid Otton, Tumwater (Wash.) High School (2006); and Rob Younger, Sweet Home (Ore.) High School (2007).